At the Standing Committee on 26/27 February, the European Commission and Member States discussed a draft Regulation which will reduce MRLs for iprodione. Unfortunately, Member States couldn’t agree on the scope of the transitional period because there is a risk of high exposure of consumers to iprodione via certain crops – some crops may exceed the acute reference dose (ARfD). Therefore, it was agreed that the Commission will ask EFSA to assess which are the crops with exceedances and these crops will be exempted from the future transitional period. Therefore, the Commission and Member States will have another exchange on this draft Regulation which may take place at the June Standing Committee meeting or via emails before that. After the final draft is agreed, it will be notified to the WTO and non-EU countries will be allowed to comment on it during a two-month period. The final vote on the draft Regulation will take place afterwards. The Commission doesn’t want to rush with the vote on this Regulation because this case will serve as a precedent for similar cases in future. More details on the discussion will be published in the report of the Standing Committee in the upcoming weeks. TMO ( Turkish Grain Board) has announced yesterday evening that they are opening their stocks for sale. These prices are 15 % higher than current running prices in market. Technically this means now there is an extra 137 000 mtons of in-shell hazelnuts available to market but at higher than market prices. From buyers side you can say that there is no risk missing hazelnuts from market besides prices will be higher. On the other hand packers believe that there has been some stock already available at the market and those stock holders will try to sell their stock as much as possible near to those levels. And if we see that no one is really buying from TMO any in coming weeks than we will think that available stock in the market will be enough in coming months as well. By begin of March we will have first outlook from orchards and this first report will affect the market more. Normally crop is developing well but about 2 weeks earlier than its normal development timing. Weather has been mild and if we pass risky period until Mid of April without any damage to crop that would mean more positive outlook for coming crop. In coming days we will see first reaction in market. Today we have seen somewhat less sellers and more buyers domestically but from current levels running in market. The 2018 Chilean prune crop is forecast at 80-85 thousand MT. The estimated carry over from last crop should be around 10 thousand MT. The 2018 prune crop has shown optimal state across the season. 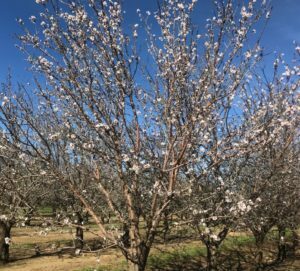 Beneficial conditions prevailed throughout the winter with many chilling hours, during spring the bloom was massive and growers expect a heavier crop with good fruit size. The most important volumes of the 2018 harvest should be concentrated between 60/70 and 70/80 u/lb. In fact, it should be taken into account that the average size of the 2017 crop which was 78 u/lb. Harvest is estimated to start on mid-February in the central valleys near Santiago. The expectation is that the first lots for 2018 crop will be available for shipment during the end of March and/or early April. Prices should remain fairly similar to 2017, since growers are expecting similar or greater returns from the packers/exporters, especially due to the downward trend shown by the US dollar versus the Chilean peso in recent months. Yesterday the Almond Board released the January position report. California shipped 193.5 million pounds, up 16.7% over last year’s 165.8 million lbs. This is a new record for the month of January, and the fourth month in a row that California has posted a new record. Domestic and Export shipments also set records, with Domestic shipping 60.18 mm lbs, up 5.0% from last years 57.29 mm, and export shipping 133.32 mm lbs, up 22.9% from last year’s 105.51 mm lbs. China again performed well, taking 8.96 mm lbs compared to last January 3.86 mm lbs. (this being for post CNY demand) and up 12% for the year to 121.29 mm lbs. India shipped pretty much flat to last January at 14.91 mm lbs, and still puts them up 33% on the year at 145.33 mm lbs. Western Europe as a whole also performed well, taking 59.81 mm lbs, up from last Januarys 50.60 mm lbs, and up 10% total on the year at 299.35 mm lbs. The Middle East finally posted positive shipments of 15.23 mm lbs, up from last Januarys 10.98 mm lbs with Turkey leading the way. It seems the reduction in Turkey is having an immediate shape on nearby and likely long-term demand. Leading up to this report, most everyone in the industry was again expecting large shipments. Overall the report executed expectations, but the receipts may be a surprise to most. The industry added just shy of 35 mm lbs, which is quite low compared to last Januarys 74 mm lbs. This puts total receipts at 2.242 bb lbs, shy of the 2.3+ bb lbs many expecting the crop to final. Today our best inference suggest a crop between 2.25 and 2.3 bb lbs. New sales were also strong at 173 mm lbs., compared to last January at 159 mm lbs. While sales are not a record month they do continue to put shippers well ahead of last year, e.g., today vs last year they have shipped and committed 225 mm lbs ahead. We are now half way through the marketing year, and have shipped a total of 1.232 bb lbs, up 10.34% from last years 1.116 bb lbs. If the industry matches last years shipments for the remaining six months (which seems feasible), it will ship a total of 2.216 bb lbs. This would be more than the 2017 crop produces after loss/exempt are taken into consideration (likely 3% +), cutting into the already marginal potential carryover we will have going into next year. While this may be too early to discuss potential carry over, it will be on people’s minds going forward. It is not too early to look to February and shipments expectations were strong even at mid-February – we think 165mm lbs plus is likely – maybe more. We seem to be off to a slow but steady sales start we have seen a return of China and India inquiries. Last year sales were no easy task at 143.6 mm lbs as demand started to pick up during and post bloom. At the same time, the five year average is just over 108 million lbs. Post report the industry is more obviously focused on is bloom. Bloom in southern California has started in the early stages, and in further north is still expected to start more widespread in the next 7-10 days. This is earlier than the ‘norm’, while California has also seen warm temperatures recently, and has a forecast for some warmer days ahead. Some fear this could create a ‘flash bloom’, which typically does not bode well for massive yielding crops but only time will tell. With the acreage today we simply need an average crop to have a record again. Rainfall and snowfall totals are also still at very low levels on an average, with not much changes expected in the foreseeable future. At this stage, more snow is obviously welcome, but more rain may do more harm than good to the developing bloom. 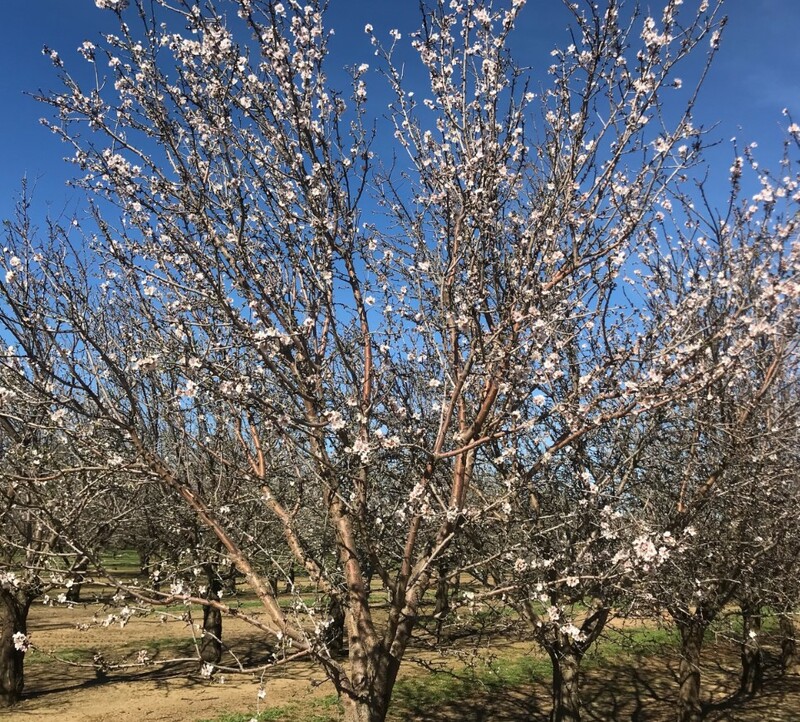 News in from California – the Almond tree bloom is progressing due to unusually warm weather in California. Some of the early varieties of Fritz/Sonora are starting to bloom.